Note that her age was recorded as 29 instead of her actual age, 32. An Inquisition indented taken for our Sovereign Lady the Queen at the precinct of Bridewell in London, on the twelfth day of February in the Twenty-fifth year of the reign of our Sovereign Lady Victoria, by the Grace of God, of the United Kingdom of Great Britain and Ireland Queen, Defender of the Faith, before William Payne, Sergeant at Law CORONER of our said Lady the Queen for the City of London and the Borough of Southwark in the County of Surrey, on view of the body of Elizabeth Eleanor Rossetti, now here lying dead within the jurisdiction of the said Coroner, upon oaths of the undersigned Jurors, good and lawful men of the said City, who being now here duly chosen sworn and charged to enquire for our said Lady the Queen, when where and in what manner the said Elizabeth Eleanor Rossetti came to her death say upon their Oaths, that the said Elizabeth Eleanor Rossetti being a female of the age of twenty-nine years, and the wife of Dante Gabriel Rossetti, an artist on the tenth day of February, at Chatham Place in the said Precinct and City, Accidentally took an overdose of Laudanum, by means whereof she the said Elizabeth Eleanor Rossetti, then and there became mortally sick and distempered in her Body of which said mortal sickness and distemper and of the Laudanum aforesaid so by her accidentally taken as aforesaid she the said Elizabeth Eleanor Rossetti, on the Eleventh day of February in the year aforesaid, at Chatham Place aforesaid did die. And so the Jurors aforesaid upon their Oaths aforesaid do say that the said Elizabeth Eleanor Rossetti in the manner and by the means aforesaid Accidentally and casually and by misfortune came to her death. To the Beadles and Constables of the Precinct of Constables of the Precinct of Bridewell of London. By virtue of my Office of Coroner of our Sovereign Lady the Queen, for the City of London and the Borough of Southwark in the County of Surrey, These are, in Her Majesty’s Name, to charge and command you that in sight hereof, you summon and warn Twenty-four good and sufficient Men of your Precinct personally to appear before me on Wednesday the twelfth day of February one thousand eight hundred and sixty two at 1/2 past 1 of o clock in the afternoon precise time, at Bridewell Hospital in the said Precinct and City then and there to do and execute all such things as shall be given them in charge, and to enquire on behalf of our Sovereign Lady the Queen, touching the death of Elizabeth Eleanor Rossetti now lying dead within my jurisdiction, and for your so doing this shall be your Warrant; and that you attend at the time and place above mentioned, to make a Return of the Names of those you have so summoned, and further to do and execute such other matters as shall be then and there enjoined you; and have you then and there this Warrant, Given under my Hand and Seal this eleventh day of February 1862. –Wm. Payne Coroner. The Execution of this Warrant appears by the Panel hereunto annexed. The answer of the Oxford Beadle. Mr. Thomas Spencer Capel Foreman. Sarah Birrill 14 Chatham Place Blackfriars says, I am Housekeeper says I knew the deceased Mrs Rossetti. I have known her 9 years, she has lived there about 2 years. This happened on Monday night after she was in bed. I saw her about 4 in the afternoon. She was quite cheerful then. At 11 she was asleep. I was called up about 1/2 past 11 by her husband. I saw her then in bed. She looked very blank (?black) in the face. A Doctor was sent for, he came directly. And he attended to her. She died at 20 minutes past 7 on Tuesday morning. She used to take laudanum occasionally to produce sleep for the last twelve-months I saw a Phial of it was under her pillow. I knew of no hurt to her, nor don’t suspect any. Her husband and herself lived very comfortable together. Clara Siddall No. 8 Kent Place Old Kent Road says, the deceased was my sister her name was Elizabeth Eleanor Rossetti. Her age 29 last birthday. I saw her on Saturday evening last she seemed in tolerably good spirits then. I have heard of her taking laudanum to produce sleep. I was sent for and saw her about 3 on Tuesday morning. She was then alive but quite unconscious. I know of know of no harm to her. I dont suspect any. I heard she had taken a few drops of laudanum in brandy and water before she went to bed. She had no family alive. Dante Gabriel Rossetti of No. 14 Chatham Place Artist says, the deceased was my wife & her name was Elizabeth Eleanor Rossetti. On Monday afternoon she was perfectly well, at about 6 or 7 we went out to dinner, but before we started she appeared drowsy and when we got half way in the cab I proposed going home again. She wished to go on and we dined at the ———— in Leicester Square with a friend. She seemed somewhat between flightiness and drowsiness, a little excited. We left there at 8 and came straight home. I went out again after 9 leaving her just going to bed. She seemed as right as before. 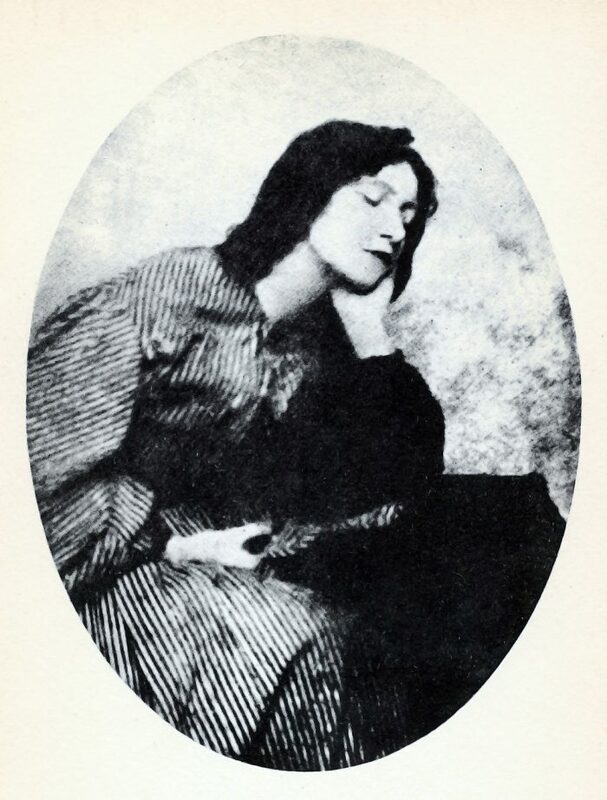 She was in the habit of taking large doses of laudanum. I know that she has taken 100 drops. I thought that she had the laudanum in brandy. I returned home again at 1/2 past 11 and then she was in bed and snoring. I found her utterly without consciousness. I found a Phial on a small table by her bedside, it was empty. The Doctor was sent for and he attended her she had not spoken of wishing to die. She had contemplated going out of town in a day or two and had bought a new mantle the day before. She was very nervous & had I believe a diseased heart. My impression is that she did not do it to injure herself but to quiet her nerves. She could not have lived without laudanum. She could not sleep at times nor take food. Francis Hutchinson of Bridge Street M.D. says, I knew the deceased and attended her in her confinement in April or May last. The child was born dead and had been dead for a fortnight before it was born. I have only seen her about once since then, that was about a month ago in the street. I was sent for on Monday night about 1/2 past 11. She was in a Comatose state- we tried to rouse her, but without any avail. She could not swallow anything. I used the stomach pump but it had no effect. I then injected several quarts of water into the stomach and washed the stomach out. The smell of laudanum was very distinct, 100 drops is a large dose. I stayed with her till 6 in the morning. I left her in the care of Mr. ? Mable, a medical friend of hers, I believe that she died from the effects of laudanum which must have been a very large dose. The Phial found in the room was about a 2 oz. Phial. It was labeled “Laudanum Poison”. She was in a very nervous condition when I saw her. Her husband appeared very much attached to her. Catherine Birrill says, I had not bought any laudanum for the deceased for 6 months. I bought a shillingsworth. The Phial was about half full. The Phial found was the one she generally used. I never saw her take any. I know of no hurt to her. I waited upon her and they lived very happily together. Algernon Swinburne 16 Grafton St. Fitzroy Square at present says, I have known the deceased and her husband. They dined with me on Monday, I saw nothing paarticular in the deceased except that she appeared a little weaker than usual. Ellen Macintire says, I live at 14 Chatham Place says I was with the deceased on Monday evening about 1/2 past 8. She seemed cheerful then. I did not see her again till Mr. Rossetti called me up at 1/2 past 11. She told me once that she had taken quarts of laudanum in her time. I have seen the Phial with laudanum in it. Taken on oath before me } Wm. Payne. Coroner. I believe that one of the jurors was an ancester of mine – James Spicer – does anyone have any more information about the jurors? My surname is Birrell,which I noticed was the Rossetti’s Housekeeper’s name.I would love to be a relative,as my grandfather Birrell came from London. I think my great great uncle Ishmael Fisher was one of the jurors. He seems to have led a colourful life! I am researching my family history. As my great great grandfather was Ishmael Fisher I wonder if there was any connection. To the best of my knowledge he was born in Calne, Wiltshire in 1816,was a wine merchant and at the time of the 1881 census was living in Chipping Barnet, Hertfordshire. In the interime he may have been a publican in London. I would be very interested to hear from you if you think there is any connection. The Age scenario would only add to the mystery of this incredible Woman. Why did they get this sooooooooooooooooooooooo wrong.